Wherever attention goes the rest of the brain follows—in some sense, attention is your brain’s boss. But is it a good boss and can we train it? Consider the following statement: Human beings only use 10 percent of their brain capacity. Well, as a neuroscientist I can tell you that, while Morgan Freeman delivered this line with the gravitas that makes him a great actor, this statement is entirely false. The truth is human beings use 100% of their brain capacity. The brain is a highly efficient energy demanding organ that gets fully utilized and, even though it is at full capacity being used, it suffers from a problem of information overload. There’s far too much in the environment than it can fully process. So to solve this problem of overload evolution devised a solution, which is the brain’s attention system. Attention allows us to notice, select, and direct the brain’s computational resources to a subset of all that’s available. We can think of attention as the leader of the brain. Wherever attention goes the rest of the brain follows—in some sense, it’s your brain’s boss. Over the last 15 years I’ve been studying the human brain’s attention system. In all of our studies I’ve been very interested in one question: If it is indeed the case that our attention is the brain’s boss, is it a good boss? Does it actually guide us well? And to dig in on this big question, I wanted to know three things: First how does attention control our perception? Second, why does it fail us, often leaving us feeling foggy and distracted? And third, can we do anything about this fogginess? Can we train our brain to pay better attention, to have more strong and stable attention in the work that we do in our lives? How does attention control perception? This is the story of a Marine captain, Captain Jeff Davis. And this is not a story about his time and on the battlefield, he was actually on a bridge in Florida. And instead of looking at the scenery around him, seeing the beautiful vistas and noticing the cool ocean breezes, he was driving fast and contemplating driving off that bridge. He would later tell me that it took all of everything he had not to do so. He just returned from Iraq and while his body was on that bridge, his mind, his attention, was thousands of miles away. He was gripped with suffering. His mind was worried and preoccupied and had stressful memories and dread for his future. But he, as a leader, also knew that he wasn’t the only one who was probably suffering—Many of his fellow Marines probably were too. And in the year 2008 he partnered with me on a first-of-its-kind project that actually allowed us to test and offer mindfulness training to active duty military personnel. But before I tell you about what mindfulness training is or the results of that study, I think it’s important to understand how attention works in the brain. So, in the laboratory, many of our studies of attention involve brainwave recordings. In these brainwave recordings people wear funny looking caps that are sort of like swimming caps that have electrodes embedded in them. These electrodes pick up the ongoing brain electrical activity and they do it with millisecond precision, so we can see small yet detectable fluctuations over time. And doing this, we can very precisely plot the timing of the brain’s activity. Attention is very powerful in terms of affecting our perception. Even though it’s so powerful, it’s also fragile and vulnerable. Things like stress and mind wandering diminish its power. What we found is that about 170 milliseconds after we show our research participants a face on the screen, we see a very reliable, detectable brain signature. It happens right at the back of the scalp above the regions of the brain that are involved in face processing. Now, this happens so reliably and so on cue as the brain’s face detector, that we’ve even given this brainwave component a name: we call it N170 component. We use this component in many of our studies. It allows us to see the impact that attention may have on our perception. We would show participants images like a face and a scene overlaid on each other. And what we do is we ask our participants, as viewing a series of these types of overlaid images, to do something with their attention. On some trials we’ll ask them to pay attention to the face. And to make sure they’re doing that, we ask them to tell us, by pressing a button, if the face appeared to be male or female. On other trials we asked them to tell us what the scene was, was it indoor or outdoor? And in this way we can manipulate attention and confirm that the participants were actually doing what we said. Our hypotheses about attention were as follows: If attention is indeed doing its job and affecting perception, maybe it works like an amplifier. And what I mean by this is that, when we direct attention to the face it becomes clearer and more salient, it’s easier to see. But when we direct it to the scene the face becomes barely perceptible as we process the scene information. So we looked at this brainwave component of face detection, N170, to see if it changed at all as a function of where our participants were paying attention, to the scene or the face. We found that when they paid attention to the face N170 was larger, and when they paid attention to the scene it was smaller. What it tells us is that attention, which is really the only thing that changed since the images they viewed were identical in both cases, attention changes perception and it does so very fast, within 170 milliseconds of actually seeing a face. Why does attention fail us, often leaving us feeling foggy and distracted? In our follow-up studies, we want to see if could we perturb or diminish this effect. And our hunch was that if you put people in a very stressful environment, if you distract them with disturbing negative images, images of suffering and violence—sort of like what you might see on the news, unfortunately—doing this might actually affect their attention. And that’s indeed what we found. If we present stressful images while they’re doing this experiment this gap of attention shrinks, its power diminishes. So, in some of our other studies we asked, if it is the case that stress has this powerful influence on attention, through external distraction, what if we don’t need external distraction? What if we distract ourselves? And to do this we had to basically come up with an experiment in which we could have people generate their own mind wandering. And the trick to mind wandering is that, essentially, you bore people. When we bore people, people happily generate all kinds of internal content to occupy themselves. So we devised what might be considered one of the world’s most boring experiments: all the participants saw where a series of faces on the screen, one after another, and they pressed a button every time they saw the face. That was pretty much it. The one trick was that sometimes the face would be upside down and it would happen very infrequently. On those trials they were told just to not press the button. Pretty soon we could tell that they were successfully mind wandering because they pressed the button when that face was upside down, even though it’s quite plain to see that it was upside down. What we found was that, very similar to external stress and external distraction in the environment, internal distraction, our own mind wandering, also shrinks the gap of attention—it diminishes attention’s power. So what do all of these studies tell us? They tell us that attention is very powerful in terms of affecting our perception. Even though it’s so powerful, it’s also fragile and vulnerable. Things like stress and mind wandering diminish its power. But that’s all in the context of these very controlled laboratory settings. What about in the real world? What about our actual day-to-day life? What about now? Where is your attention right now? I’d like to make a prediction about your attention. Here’s the prediction: You will be unaware of what I’m saying four out of the next eight minutes. It’s a challenge, so pay attention, please. Now, why am I saying this? A growing body of literature suggests that we mind wander, we take our mind away from the task at hand, about 50 percent of our waking moments. These might be small little trips that we take away, private thoughts that we have. And when this mind wandering happens it can be problematic. Imagine a military leader missing four minutes of a military briefing, or a judge missing for minutes of testimony, or surgeon or firefighter missing any time. The consequences in those cases could be dire. So, one question we might ask is: Why do we do this? Why do we mind wander so much? Part of the answer is that our mind is an exquisite time traveling master. It can actually time travel very easily. If we think of the mind with the metaphor of a music player we see this: We can rewind the mind to the past to reflect on events that have already happened; We can go into the future to plan for the next thing that we want to do. We land in this mental time travel mode of the past or the future very frequently, and we land there often without our awareness, even if we want to be paying attention. Think of the last time you were trying to read a book, and you got to the bottom of the page with no idea what what the words were saying. A growing body of literature suggests that we mind wander, we take our mind away from the task at hand, about 50 percent of our waking moments. When this happens, when we mind wander without an awareness that we’re doing it, there are consequences. We make errors. We miss critical information sometimes, and we have difficulty making decisions. What’s worse is when we experience stress, when we’re in a moment of overwhelm, we don’t just reflect on the past when we rewind, we end up being in the past ruminating, reliving, or regretting events that have already happened. Or under stress we fast forward the mind, not just to productively plan, but we end up catastrophizing or worrying about about events that haven’t happened yet and frankly may never happen. So at this point you might be thinking to yourself, OK mind wandering is happening a lot. Often it happens without our awareness. And under stress it’s even worse, we mind wander more powerfully and more often. Is there anything we can possibly do about this? And I’m happy to say the answer is yes. From our work we’re learning that the opposite of a stressed and wandering mind is a mindful one. Mindfulness has to do with paying attention to our present moment experience with awareness and with without any kind of emotional reactivity of what’s happening. It’s about keeping that button right on play to experience the moment to moment unfolding of our lives. And mindfulness is not just a concept, it’s more like practice. You have to embody this mindful mode of being to have any benefits. So we’re offering people programs with a suite of exercises that they should do daily in order to cultivate more moments of mindfulness in their life. And for many of the groups that we work with, high stress groups, like soldiers, medical professionals, for them mind wandering can be really dire. So we want to make sure we offer them very accessible, with low time constraints, to optimize the training so they can benefit from it. When we do this we also track them to see what happens, not just in their regular lives, in the most demanding circumstances that they may have. Why do we want to do this? Well we want to, for example, give it to students right around final season. Or we want to give the training to accountants during tax season, or soldiers and Marines while they’re deploying. Why is that? Because those are the moments in which their attention is most likely to be vulnerable because of stress and mind wandering. And those are also the moments in which we want the retention to be in peak shape so they can perform well. Mindfulness exercises are very much like physical exercise: If you don’t do it, you don’t benefit. But if you do engage in mindfulness practice, the more you do the more you benefit. So we have people take a series of attention tests and we track their attention at the beginning of some kind of high stress period and then two months later we track them again. We want to see if there’s a difference. 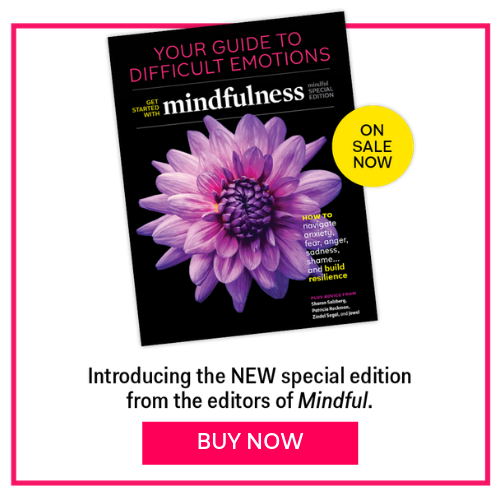 Is there any benefit to offering the mindfulness training? Can we protect against the lapses in attention that might arise over high stress.? Here’s what we find: over a high stress interval, unfortunately the reality is, if we don’t do anything at all attention declines. People are worse at the end of this high stress interval than before. But if we offer mindfulness training we can protect against this. They stay stable even though, just like other individuals in their group, they were experiencing high stress. And perhaps even more impressive is that, if people take our training programs over eight weeks, and they fully commit to doing the daily mindfulness exercises that allow them to learn how to be in the present moment, they actually get better over time even though they’re in high stress. And this last point is actually important because what it suggests to us is that mindfulness exercises are very much like physical exercise: If you don’t do it, you don’t benefit. But if you do engage in mindfulness practice, the more you do the more you benefit. I want to just bring it back to Captain Jeff Davis. As I mentioned to you at the beginning, his Marines were involved in the very first project that we ever did offering mindfulness training. And they showed this exact pattern, which was very heartening. We had offered them the mindfulness training right before they were deployed to Iraq. And upon their return, Captain Davis shared with us what he was feeling was the benefit of this program. He said that unlike last time, after this deployment they were much more present, they were discerning, they were not as reactive, and in some cases they were really more compassionate with the people that were engaging with and each other. He said in many ways he felt that the mindfulness training program we offered gave them a really important tool to protect against developing post-traumatic stress disorder and even allowing it to turn into post-traumatic growth. To us this was very compelling. It ended up that Captain Davis and I, you know this was about a decade ago in 2008, we’ve kept in touch all these years. And he himself has gone on to continue practicing mindfulness and in a daily way. He was promoted to Major, then he retired from the Marine Corps. He went on to get a divorce, to get remarried, to have a child, to get an MBA. And through all of these challenges and transitions and joys of his life, he kept up with his mindfulness practice. And, as fate would have it, just a few months ago, Captain Davis suffered a massive heart attack at the age of 46. He ended up calling me a few weeks ago and he said: I want to tell you something. I know that the doctors who worked on me they saved my heart, but mindfulness saved my life. The presence of mind I had…The clarity of mind I had to notice when there was fear and anxiety happening, but not be gripped by it. He said: For me, these were the gifts of mindfulness. And I was so relieved to hear that he was OK, but really heartened to see that he had transformed his own attention. He went from having a really bad boss, an attention system that nearly drove him off a bridge, to one that was an exquisite leader and guide and saved his life. So, I want to end by sharing my call to action to all of you. And here it is: Pay attention to your attention. Pay attention to your attention, and incorporate mindfulness training as part of your daily wellness toolkit in order to tame your own wandering mind and to allow your attention to be a trusted guide in your own life. Principal Investigator, Associate Professor of Psychology and Director of Contemplative Neuroscience, Mindfulness Research & Practice Initiative, University of Miami. Her research focuses on the brain bases of attention, working memory, and mindfulness-based training. With grants from the US Department of Defense and several private foundations, her current projects investigate how to best promote resilience in high stress cohorts using contemplative/mind training techniques that strengthen the brain’s attention networks. She was selected as a Science and Public Leadership Fellow by PopTech, and serves on editorial review boards of Frontiers in Human Neuroscience, Journal of Experimental Psychology: General, Frontiers in Cognitive Science, and Frontiers in Psychology.